Four years ago, on this day, a brown little girl was born to Yatzie - her name is Moët, Yatzie's very first baby! 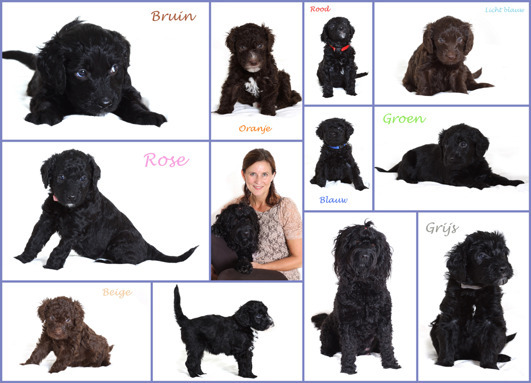 After her came another 9 sweet barbet puppies, making my birthday the happiest ever! Because they were born on my brithday they all got Champagne names! Today we toast on their 4 year birthday! What is even more special - today Moët is already showing signs of preparing for birth! Her temperature is going down and reached the bottom an hour ago. We could expect puppies within the coming 48 hours! Or maybe Moët is trying to make me and herself a special birthday gift, just like her mother did? She still has a 8 hours to succeed in that. We are very excited here and if it is today, tomorrow or Saturday these puppies are so longed for and welcome! We wish you strength and succes darling Moët in this great work laying in front of you.